user warning: Expression #1 of ORDER BY clause is not in SELECT list, references column 'hotkilns_live.n.created' which is not in SELECT list; this is incompatible with DISTINCT query: SELECT DISTINCT n.nid, n.vid, n.title FROM content_field_series_accessories nr INNER JOIN node n ON n.vid = nr.vid AND n.status = 1 INNER JOIN node_access na ON na.nid = n.nid WHERE (na.grant_view >= 1 AND ((na.gid = 0 AND na.realm = 'all') OR (na.gid = 0 AND na.realm = 'content_access_author') OR (na.gid = 1 AND na.realm = 'content_access_rid'))) AND ( nr.field_series_accessories_nid = 263 )ORDER BY n.created DESC in /home/hotkilns/public_html/sites/all/modules/nodereferrer/nodereferrer.module on line 428. Optional bottoms with elements are available for the all 23" and 29" diameter Jupiter kilns (in fact all kilns except the J18 and J18X). Powered bottoms for the 23" diameter kilns (J23, J230, J236, J245 & JD automatic versions) have one element which is gives the bottom 1/2 the power of a section ring. The 29" diameter kilns (J2918, J2927, J2936, J2945 and JD automatic versions) have two elements on the bottom which gives the bottom 2/3 the power of a section ring. The elements have the same resistance as the side elements - which simplifies replacement. The bottom elements work off of a separate power circuit. In the manual kilns this circuit has its own infinitely variable zone switch. In the automatic versions this power circuit is controlled by the bottom zone of the DynaTrol. You also have the ability on the DynaTrol to control the amount of time that the bottom elements come on relative to the bottom zone (i.e., 10% to 100% of the time on that the bottom zone asks for heat). These are highly recommended for the larger kilns because they improve gradient uniformity (by reducing cold spots in the bottom) and improve heat up times. 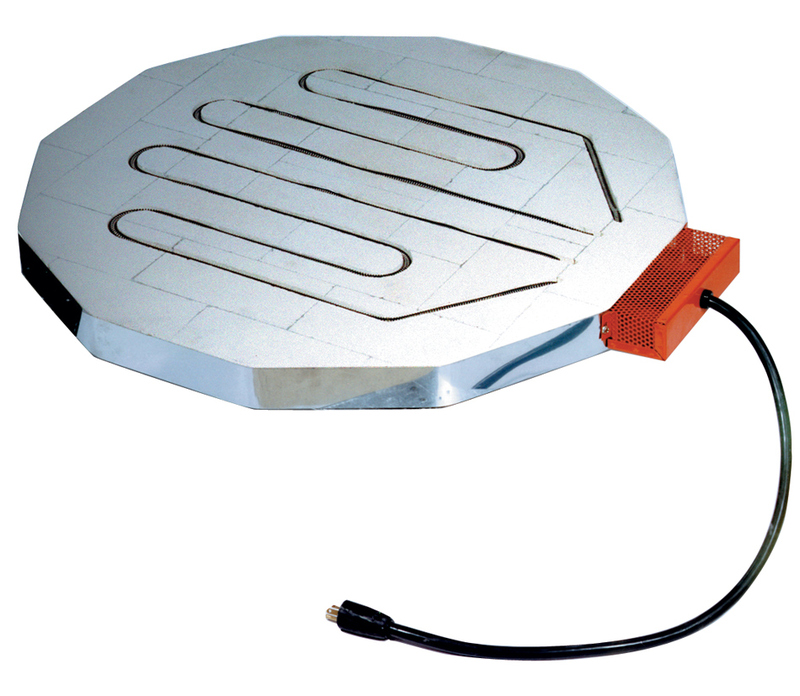 You can increase the temperature rating of a J23 or a J2918 to Cone 10 with a powered bottom. The bottom is not reversible on powered bottoms. The price and part numbers are incorporated into the actual kiln models so no part numbers are listed here. If you are ordering replacement power bottoms for existing kilns click here. How to adjust the amount of power going to a powered bottom using the settings in the DynaTrol.